Twist Collective Fall 2016 has launched! Editor, Kate Gilbert introduces this edition with some wise words. "There's something about knitting that brings a sense of peace. Maybe it's the clicking sound of the needles and the soothing repetition of stitches or maybe it's just the feel of the fiber and the wonder of something beautiful take shape in your hands. Stitches interlock, patterns form and stress leaves." Whatever your reason for knitting is your sure to find something enticing in this issue. I have my first design for Twist Collective in this edition. 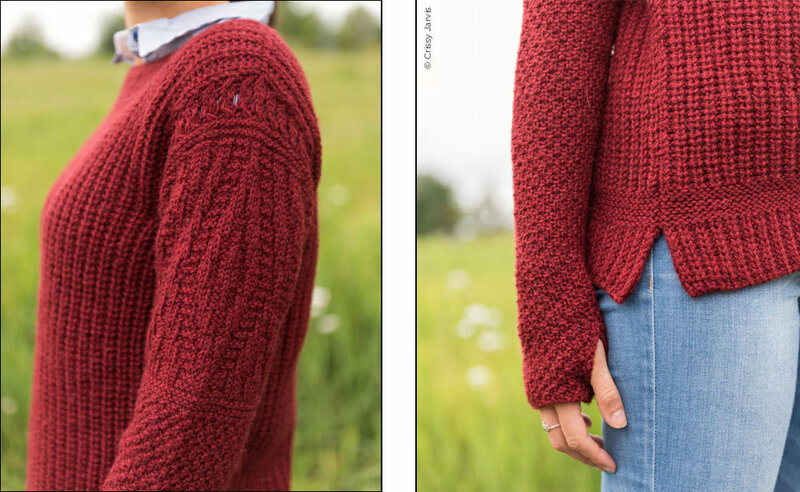 Carnelian is a casual, go-to pullover with a few interesting design elements. At first blush Carnelian appears to be a straight forward Fisherman's Rib pullover. Some of the details that make it unique include a split hem, with a garter band separating the hem from the body. A "twist" in the design is that the hem and the body present opposite sides of the half-fisherman's rib pattern. Designed as a modified drop shoulder, the sleeves are picked up at the armhole and worked down to the cuff. A detailed lace and diamond pattern are the defining design element of the sleeves. A favorite element are the thumb loops, incorporated into the extra long sleeves. Your hands will be toasty warm as you head out for those long walks in the crisp autumn air. Of course, if thumb loops are not your thing you could easily just bind off at your usual sleeve length. Finally, the round neck has garter ridges worked into the fisherman's rib, adding just a bit of extra detail. This sample is knit with The Fibre Co. Cumbria Worsted in Appleby Castle. This yarn holds stitch definition beautifully and the wool, mohair combination is a delight to work with. Thanks to Chrissy Jarvis for the great photos. Visit Twist Collective to see Carnelian and sharpen your needles for some fall knitting.